The first child of David and Rhoda Haynes, Landon Carter Haynes was born on December 2, 1816, in Carter County, Tennessee. A farmer and slave owner, he was also an attorney, newspaper editor, and briefly, a Methodist minister. However, Landon Carter Haynes is best remembered as a legislator, politician, and Confederate senator from Tennessee. Landon Carter Haynes attended Washington College and was one of five students who graduated in 1838. Following graduation, he studied law with Thomas A. R. Nelson and was admitted to the bar in 1840. In 1839, he married Eleanor Powell of Elizabethton, Tennessee. Figure 1. The headline of a March 27, 1840 edition of the Tennessee Sentinel, one year before Haynes became one of the paper’s editors. In 1841, Haynes became editor of the Tennessee Sentinel, a newspaper published by his brother-in-law, Lawson Gifford. The Sentinel was published in Jonesborough, Tennessee. The Sentinel was a “strongly Democratic” newspaper, which created a political feud between Haynes and William G. Brownlow and his Whig newspaper. The feud escalated when Haynes and Brownlow began fighting in the streets of Jonesborough. As Brownlow beat Haynes over the head with a pistol, Haynes produced a pistol of his own and shot Brownlow through the thigh. This ended the scuffle, but not their bitter rivalry. Haynes went on editing the Sentinel until Lawson Gifford sold the paper in 1846. Figure 2. 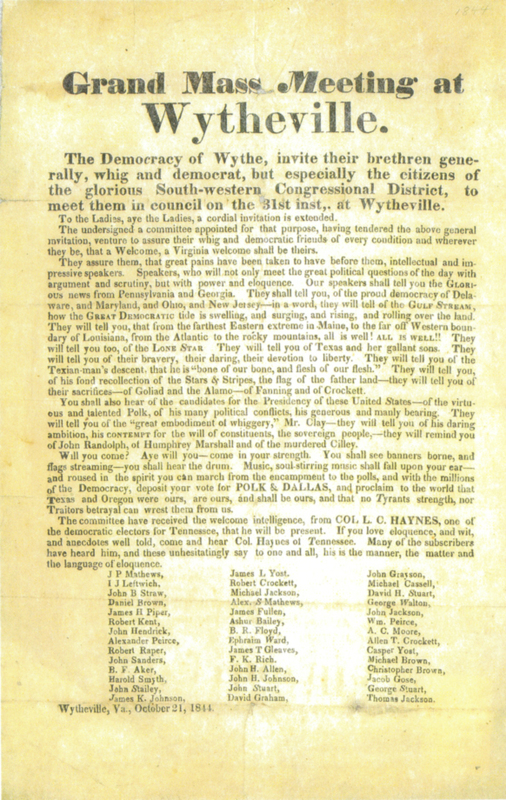 The top part of the 1844 broadside of the Wytheville, Virginia political meeting featuring Haynes as a guest speaker. The full 1844 broadside is located further on. Landon Cater Haynes entered the political arena in 1844 as the Democratic candidate for presidential elector in the First Congressional District of Tennessee. During that election year, he campaigned for Democrat James K. Polk, the Democratic presidential candidate from Tennessee. An 1844 broadside of Wytheville, Virginia lists “Colonel L. C. Haynes” as a democratic speaker for a political “Grand Mass Meeting” of the presidential election (Haynes was never a “Colonel”). Polk won the 1844 presidential election by defeating Whig candidate Henry Clay (Polk became the 11th president). In 1845, Haynes decided to run for a seat in the Tennessee state legislature. He was elected to the lower house, where he represented Washington, Greene, and Hawkins Counties during the 26th General Assembly (1845-1847). 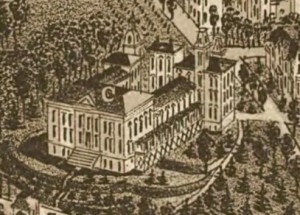 During this assembly, Haynes voted for the creation of a deaf and dumb school in Knoxville, Tennessee. Figure 3. A close-up view of the Deaf and Dumb School from an 1886 map of Knoxville. Courtesy of the Library of Congress Geography and Map Division. Haynes opted out of running against fellow Democrat Andrew Johnson for Congress in 1847, but instead sought election to the upper house of the Tennessee state legislature. He was elected to the 27th General Assembly (1847-1849) and represented the counties of Carter, Johnson, Sullivan, and Washington. During this assembly, Haynes introduced a bill to incorporate the East Tennessee and Virginia Railroad Company. The bill passed on the first reading and the company was to construct a railroad from Knoxville to Bristol, Tennessee, which would then connect with a southern Virginia terminus being constructed from Lynchburg, Virginia. During the 1848 presidential election, Landon Carter Haynes again campaigned as a Democratic presidential elector. The presidential candidate whom Haynes campaigned for was Democrat Lewis Cass of Michigan. Cass defeated Free Soil candidate Martin Van Buren, but was runner-up to Whig candidate Zachary Taylor, who became the 12th president. Figure 4. A Civil War Era photograph of T. A. R. Nelson. Courtesy of the Library of Congress Prints and Photographs Division. 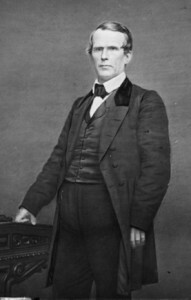 From 1849 through 1851, Haynes served in the 28th General Assembly in the lower house of the Tennessee state legislature. He represented the counties of Washington, Greene, and Hawkins. During this assembly, Haynes was elected speaker of the state house of representatives. This marked the high point of his career as a state legislator. In 1851, Haynes opposed Democrat Andrew Johnson for the election to the United States House of Representatives – the Whig party did not nominate any candidate to oppose the two Democrats. In the toughest campaign of his political career, a contemporary described the campaign as “intensely bitter and personal.” Johnson defeated Haynes by more than 1,600 votes. During the 1850s, Landon Carter Haynes focused primarily on his law practice, but after nearly a decade out of politics, Haynes again ran for Congress in 1859. This time his opponent was his former law instructor, Thomas A. R. Nelson. In contrast to the earlier contest between Haynes and Andrew Johnson, “politeness and courtesy characterized this otherwise strenuous struggle.” In this campaign, Haynes barely lost to his Whig opponent by ninety votes. Figure 5. 1844 broadside of the political meeting in Wytheville, Virginia. “Col. L. C. Haynes” is visible in the last paragraph. Courtesy of The Library of Virginia. Haynes, Landon Carter: broadside (1844), Tipton-Haynes Historic Site Civil War Exhibit Collection, Tipton-Haynes State Historic Site, Johnson City, Tennessee. Oliver P. Temple, Notable Men of Tennessee from 1833 to 1875: Their Times and Their Contemporaries (New York: The Cosmopolitan Press, 1912), 378. Haynes, Landon Carter: from Alexander, Thomas B., Thomas A. R. Nelson of East Tennessee (1956), Tipton-Haynes Historic Site Civil War Exhibit Collection, Tipton-Haynes State Historic Site, Johnson City, Tennessee. Haynes Family Collection. Tipton-Haynes State Historic Site, Johnson City, Tennessee. Mary Hardin McCown Collection. Tipton-Haynes State Historic Site, Johnson City, Tennessee. Temple, Oliver P. Notable Men of Tennessee from 1833 to 1875: Their Times and Their Contemporaries. New York: The Cosmopolitan Press, 1912. Tipton-Haynes Historic Site Civil War Exhibit Collection. Tipton-Haynes State Historic Site, Johnson City, Tennessee.